Much of the discussion about China’s great economic rise seems to be at the macro level, considering the global impact and the political, financial, economic and social implications. But we should also consider the way in which individual Chinese businesses are forging ahead, and the new business models they are bringing to the table. Fortunately we have a guide to help us. Amy Karam is a speaker, consultant, author and corporate instructor drawing upon years of experience, particularly for Cisco Systems. Her book The China Factor: Leveraging Emerging Business Strategies to Compete, Grow and Win in the New Global Economy addresses these very strategies and suggests methods for businesses to compete in the battle for new markets. Can you describe your experience competing against Chinese companies and what led you to write The China Factor? The book is based on my leading a competitive sales support program at Cisco for almost four years. My mandate was to be the corporate escalation point for challenging strategic deals when they were up against Chinese competitors; I advised them on sales strategy and brought the right resources and expertise to the table. The other major part of the job was to report back to executive management on what was happening with the sales teams in all the regions. The trends and results were eye-opening. The Chinese consistently did business differently than we did and competed in ways that we were not accustomed to. So we had to change as an organization in order to succeed more often in emerging markets and when competing with emerging competitors. Having gone through that, I wanted to share these learnings with more Western companies. I knew this was more than a blip. So the book is comprised of much more than just my experience: it includes a lot of research on many other companies, as well as interviews. Do you lecture or consult in China, or is your practice about helping businesses take on the Asian business tigers (as it were)? Yes, both – I have received many requests to lecture and consult for Chinese clients, in addition to Western-based companies. as well. The learning goes both ways. In fact, the Chinese are very good at learning from other nations on business practices and innovation methods. There are many delegations who come to Silicon Valley and Canada to learn new business and innovation practices. In the book I also talk about ‘coopetition’ – the need for East and West to learn from each other, build upon each other’s strengths and allow cooperative competition i.e. market access in some cases. This is the new global paradigm. The world is getting smaller and larger at the same time. We need each other’s knowledge, business and innovation practices as well as access to new markets. This will take time. You add Politics to the traditional 4 P’s of marketing – what are the benefits of Chinese government involvement with business? Chinese government involvement with business has greatly assisted Chinese companies in international expansion because they serve as ambassadors in trade agreements and influence business decisions. The Chinese government incorporates specific deals into trade agreements at the very top levels. When the discussions are about billions of dollars and trade deals that help the development of a country or allow market access, a specific company deal worth millions of dollars is marginal to the bigger picture. Naturally, when the Chinese government provides opportunities to Chinese companies in other countries, the benefits are significant. Financial backing by the government is a great accelerator in customer acquisition and global expansion. However these two areas of influence are not always well-received by other nations and competitors, given the boundaries they cross even by WTO standards – so there is a fine balance between benefits and broader repercussions on a global political scale. Is there anything holding back Western governments from doing similarly? There is a philosophy in the US government whereby American companies are all treated equally and do not receive favors. This, therefore, is less helpful to specific companies as they go abroad. The West also has a different approach in trade agreements, being less insistent on the acceptance of similarly specific elements, taking a more collaborative approach, which might have a greater win-win result than one side being more particularly successful than another. You describe how Chinese companies are focused on the long-term, willing to forgo profits in the short-term to drive market share. But we also see many instances of short-term thinking, like using inferior materials for short-term profits. Can you reconcile the two? I think short-termism results from an aggressive growth strategy and accelerated market penetration approach. Frankly, overconsumption in developed nations has fueled this situation, making it okay for the trade-off of cheaper production and purchasing prices. Having said that, the next generation approach for the Chinese, if they want to become true global players, would be to start off with a more gradual growth strategy by not compromising on quality and inferior materials. I know China wants to create its own brands; this which will be more easily achieved if it starts businesses with high standards instead of treading backwards to build this after they have acquired market share. Chinese tech companies like Huawei are now making great strides internationally, after years of trying. What have they been finally getting right? Huawei and other tech companies used Western technology success to launch their endeavors and make a start; however, I believe that their turning points occurred when they applied their own ingenuity and unique market strategies. In the case of Huawei, they shifted their strategy to the consumer market and became strong in the handset business, acquiring a level of brand recognition and market share. I also think that talent acquisition from the West has been a big part of success for Chinese tech companies. We saw this with Xiaomi recruiting the now VP of Global Hugo Barra from Google. This reinforces the premise that success occurs by using building blocks from other successes but then creating customized approaches. What can Western economies do to manage the challenge from Asian companies which can significantly undercut them. How can Western countries and businesses compete, can there be a general strategy? The advice to Western-based companies is to not get into the pricing game because no one wins in the end. While some discount matching is possible, it is important to stay true to the broader value that a company brings to a customer. Sales teams need to be trained on how to be strong in presenting this positioning. Elements to highlight to customers in these situations is the brand equity that a company brings to the table, the product quality, and some of the less obvious but still important elements like sustainability and reliability of a company. Also important is to position the value of expertise and the price or cost that this brings to the Western company’s offer. What is your perspective on future relations between China and the USA? Future relations between China and the USA must and will continue in a positive direction. There is no other option to ensure mutual growth and wellbeing for both nations and for the world. They are both so influential in the global economy that they must work together for the betterment of all. In the book, I highlight that the Chinese actively pursue partnerships as a core part of their global expansion strategy. However, I might add that Chinese companies would do better if to they developed partnerships that allow the partner to win as well. Too often it appears that “win-win” means China wins twice, through selective enforcement of regulations. If you want to have friends, you have to treat them like you would want to be treated. This attitude will help accelerate a similar cross-border collaborative spirit as other nations will reciprocate. What are the most important strategies and actions that Western companies must learn from Chinese corporations? Western companies need to adopt a longer-term approach and commitment to their global expansion strategy, especially into emerging markets. They need to understand that business in and with emerging markets is no longer a novelty but a necessity. And Western companies need to understand that business is done differently there – oftentimes, customer relationships and local cultural knowledge are much more effective and important to customers than product superiority. The Chinese get this. They demonstrate longevity by assisting with socio-economic development goals, as we’ve seen particularly in Africa . Westerners need to get better at not just flying in for a few days of meetings and still expecting emerging markets customers to buy their product. The cooperative interaction between China’s government and corporations is a significant contributor to accelerating growth, both at the micro and macro level. Some Western governments must could do better at government-private sector collaboration from a commercial perspective, to encourage and advance global expansion efforts. Zhang Weiwei made quite a splash in China with his books The China Wave and The China Ripple. Both bestsellers, they defended the China development model and refuted the desirability, or even the need, to follow the Western template (if there is such a thing). His staunch defence of China’s culture and politics (the two essentially being inseparable) was a forceful counterpoint to the idea of China being Westernized by economic development. 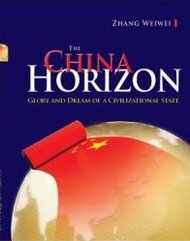 Now The China Horizon aims to tell the “glory and dream of a civilizational state”. The thesis remains the same, just presented with further details, data and argument. Is Zhang’s argument compelling? In one sense it is irrefutable. As a political insider (he was once a translator for Deng Xiaoping, and includes a rather unnecessary hymn of praise to the great leader), you have the sense of the book being close to official (if unstated) thinking. As a document of the assumptions and prejudices of the Chinese political class, it is unrivalled. But on the other hand, when examined at critically, its thesis is predicated on shaky premises. Zhang is jingoistically anxious to present China in the strongest light, and to expose the flaws of the West, but does so by straining credibility. He says that Western governments lack continuity because of the multi-party system, forgetting the role of civil services in ensuring precisely that. Noting that a sixth of the US population lack medical insurance (true in early 2014), he fails to mention the continued rapid decline of the uninsured under Obamacare, not to mention the considerable weaknesses of the Chinese system. Much is made of the financial crisis of 2008, with Zhang using it as to demonstrate Western decline, in comparison to Chinese strength and wisdom. These constant partialities obscure Zhang’s numerous just remarks regarding the Western powers’ hypocrisy and self-interest. The China Horizon was first published in China in 2014, and is now for the first time available in English. The text is unfortunately riddled with minor grammatical errors and infelicitous phrasing. One expects better from a professional publisher.